This month in FLYER, Ian Seager flies an example of pure aviation beauty, the de Havilland Canada DHC-2 Beaver. Versatile and dependable, it's certain that this go-anywhere STOL workhorse is one of the world’s very special aircraft. Elsewhere, Joe Fournier gets a first look at AOPA's Reimagined 152, while Sarah-Jane Prew offers essential advice to make sure that if you need to ditch your aircraft – you can survive to tell the tale. Also, in Part II of his series on pre-purchase advice, Jerry Parr focusses on the physical inspection of the aircraft. In a stunning flying adventure that proves some of the best flying fun can be had close to home, Paul Kiddell shares his love of the wild, beautiful, aviation-friendly North, while in his Safety section, Joe Fournier says that with so much trust placed on others in aviation – engineers, inspectors, other pilots – sometimes it pays to be a little paranoid. In Top Gear, Jake Price takes a first look at the latest pilot watches launched at Baselworld 2015, while our Bush Pilot finds himself working the night shift in this month's tale from the Australian Outback. 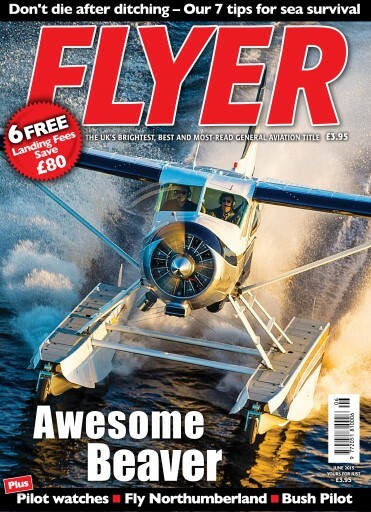 With all this, plus the chance to save a whopping £80 in landing fees, the latest news, comments, and much more – it’s easy to see why FLYER is the brightest and most-read GA title in the UK.